Home » There’s a crocodile on campus. Here’s how to live with it. There’s a crocodile on campus. Here’s how to live with it. On Aug. 31, students whipped out cellphones after spotting it along the edge of Lake Osceola. Then it was spotted by the UM School of Business. 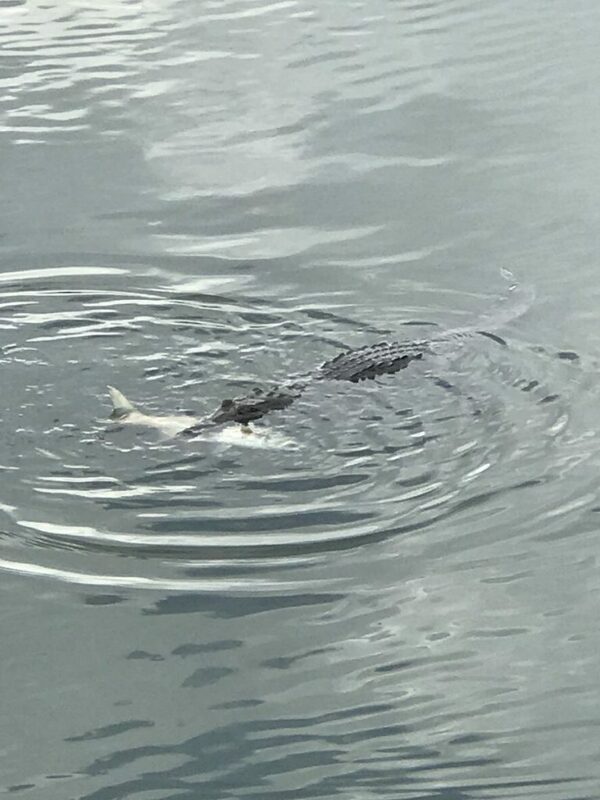 A four-foot-long American crocodile has been lingering in the waterways throughout the University of Miami’s Coral Gables campus for months. But when Senior Facilities Manager Son Vo brought in a crocodile response agent from the Florida Fish and Wildlife Conservation Commission, the consensus was that no one need be alarmed. “These guys are pretty mellow,” FWC Agent Mark Parry said during a Sept. 27 visit to campus. Parry had been riding around campus in a golf cart with Vo, unsuccessfully trying to find the infamous crocodile. But Parry hadn’t come to catch the croc and remove it – he was there to start a program with Vo to educate students on how to live with crocodiles – a Floridian reality. With Lake Osceola spraying water in the middle of an obviously man-made campus, students can forget that any body of water in Florida can be home to a crocodile or an alligator, Parry said. “Be pleasantly surprised if there isn’t one,” Parry said. For a crocodile, a top predator in its environment, being unafraid around humans is a natural behavior. The real issue arises when humans start interacting with crocodiles by feeding them or trying to catch them. Parry said that’s when a crocodile’s behavior changes and it can become a threat to humans and other animals. But incidents involving crocodiles are rare, especially with what Parry called the calm American crocodile. Until about a decade ago, crocodiles were barely visible for Floridians because they were on the national endangered species list. In the 1970s, there were an estimated 200 to 300 crocodiles in the wild, Parry said. Now, there are a reported 2,000 to 3,000, thanks to federal and state conservation efforts. Because of this conservation program, crocodile experts are sent in to assess situations and try behavioral modifications – Parry said the animals are “smart” and will change their behaviors – and if that fails, translocation to a nearby body of water and, in the worst-case scenario, move the crocodile a few miles away. There is so much misinformation about wildlife and how humans should interact with it that education is a top priority, Parry said. Vo will be tabling on the Coral Gables campus in the coming months, passing out guides to living with crocodiles and answering questions about the one on campus.